Welcome back to the Transworld Tile blog! 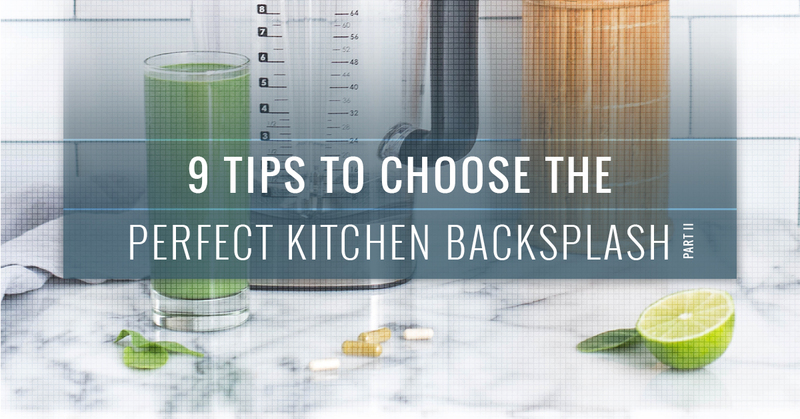 We’re sharing the top nine tips to choose the best kitchen tile backsplash for your remodel project. In part one we shared five tips, and in this post, we’ll share the four remaining four tips. If you’re in the middle of a kitchen remodel or are considering a backsplash replacement, visit our showroom today. We’ve been serving Thousand Oaks, Los Angeles, and San Fernando for more than three decades. Intentional contrast creates an inspired style and feel to any kitchen. When it comes to your backsplash, consider how it fits in with the other style and design elements in your kitchen. Does it clash with the countertop or contrast effectively to create an elegant look? Consider stacking your tiles vertically instead of horizontally, if you’re going for a contemporary look. Have you ever seen the backsplash tile that attracts magnets and other kitchen tools and utensils? It may be beneficial to find a tile material that’s magnetized to help organize your kitchen-counter space. You can store knives, utensils, kitchen components, and more on your backsplash, clearing the counter for other uses. Ceramic and porcelain are both elegant, wonderful materials. They offer various designs and styles to enhance your kitchen. However, porcelain is denser than ceramic, even though both are made from clay, which offers a more durable tile. Consider the density and durability of your tile when choosing the material for your kitchen backsplash. You may not consider getting the best grout for your tile installation, but that would be a mistake. If you want to invest in tile for your kitchen backsplash, you want it to last a lifetime. This means you need to get the best grout for the job. If you’re going to remodel your kitchen entirely or simply replace the backsplash, set your budget before you even go shopping. It’s always helpful to have a number when choosing the best kitchen backsplash tile. At Transworld Tile, we have hundreds of tile options from glass, porcelain, ceramic, to marble and more. Our budget-friendly and affordable selection can meet the needs and budget of any of our clients. Whether you want to use marble tile for your backsplash or keep things budget friendly with a ceramic tile, we can help. Visit The Transworld Tile Showroom Today! It’s been more than 30 years since we opened our doors for business. We’ve proudly served Thousand Oaks, San Fernando, and Los Angeles with all their tile needs. If you’re in need of a kitchen backsplash remodel, visit our showroom today to find the best tile for your project. You can also call us and discuss your project, any questions you may have, or ask for advice on how to find the best prices in the area. We’re always excited to help.